ROUND ONE of the DOG vs CAT Tournament RESULTS ARE IN! The DOG vs CAT Battle of the Bands Tournament ROUND ONE Results are in! (Hey, if you’re looking for the Monday’s Music Moves Me post, scroll down or click here). 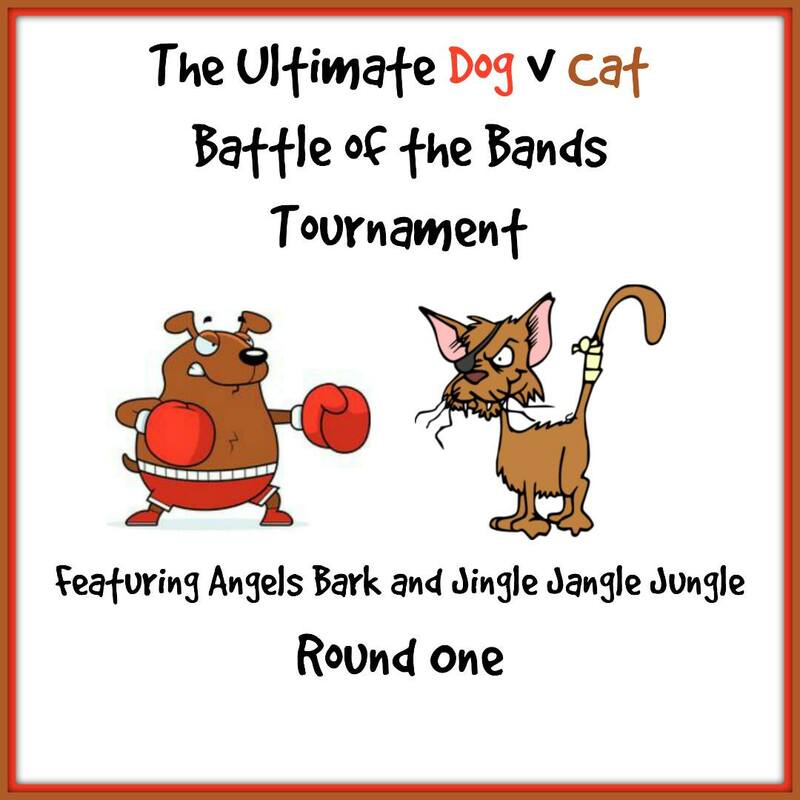 In case you’re out of the loop and aren’t sure what’s going on here, Mary from Jingle Jangle Jungle and I have teamed up to do the Ultimate Dog vs Cat Battle of the Bands Tournament. You can go back to my original Round One DOG Battle post for full details, or Mary’s Round One CAT Battle. It was a bonafide dog-fight (although at first Zeppelin was getting all the votes). Unfortunately it’s summer and the number of participants is way down so there were only nine voters. So of course my vote went with the three others who voted for Ted Nugent. Be sure to go check out the Round One CAT results at Jingle Jangle Jungle where Mary featured Nitro and Pantera duking it out over Ted Nugent’s Cat Scratch Fever! And be sure to mark your calendars and come back on August 1st for ROUND TWO of this Ultimate Dog v Cat Battle of the Bands Tournament! Round Two will feature battles with Soft Rock Dog and Cat songs! What songs might those be?? Come back on 8/1 and find out! This entry was posted in Stories and tagged Battle of the Bands, Black Dog, BOTB, Cat songs, Dog Eat Dog, Dog songs, Dog v Cat, Led Zeppelin, Ted Nugent, The Ultimate Dog vs Cat Battle of the Bands Tournament by greyzoned/angelsbark. Bookmark the permalink. Well, I’ve been sayin’ all day that I just don’t get this hard or acid rock, but if this is hard rock (okay, gonna show my age here) I dig it… totally… in otherwords ROCK ON to Led Zeppelin “Black Dog” YOU TOTALLY ROCKED THE HOUSE.. I MEAN DAM YOU BLEW THE ROOF OFF! Yep, i was totally rockin’ to these… I even stopped cleaning house for a while & turned up the volume.. hahahaha Neighbors must think I flipped out.. hahahaha Good job girlfriend… NO GREAT JOB! OH YEAH, now that last version OH YEAH THEY STILL ROCK IT & PERSONALLY I’M LUVIN SECOND VERSION THE BEST… YOU HAVE ROCKED THE ROOF OFF MY FRIEND!!! GREAT JOB IN PUTTIN’ THIS BAND/TUNE TOGETHER… YOU LITERALLY ROCKED MY SOUL! WOO HOO! TURN IT UP TO 11….. WOO HOOOOOOOOOOOOEYYYYYYYYYYY!!!!! Uh-oh gotta run hubby will be home in a bit, and my housework isn’t done… gotta ROCK ON OUT!!!!!!!! THANKS MAMA YOU ROCK!!! TRULY ENJOYED MYSELF!!! >>… the whole Free For All album brings back a rush of memories for me from the late 70s, which were my glory days, so to speak. I think I’m older’n you, MICHELE, and yet my “glory days” (so to speak) were the early 1980s — like, ’81-’85. Close Battle! Have you and MMQE discussed what you will do in the event of any ties during this tournament? I’m sorry your ears didn’t match mine this time. I agree that “Blag Dog” has been played to death over the years, but that didn’t stop me from voting for it in your battle. It rocks hard and that’s what my ears are listening for. Thanks for letting us know which version prevailed. Enjoy your evening and the rest of the week, dear friend Michele! My favorite won 🙂 This is so much fun! Next round I ‘might’ have a blowout, possilby a shutout… but the song choice is good. I think it just depends on what way the wind is blowing that day.